Artistically Decorated With Gefilte Fish Sterlet Baked Entirely Is A Delicacy From The Chef - A Dish Of Venison. Photo title: Artistically decorated with Gefilte fish sterlet baked entirely is a delicacy from the chef - a dish of venison. 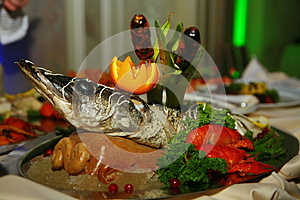 Festively covered table with stuffed fish and fresh vegetables. appetizer buffet, a dinner party at a Russian restaurant. Pike dish decorated with parsley and onion. Baked stuffed sturgeon (Dish of Russian kitchen).